What is cool is that, what I mean when I say “edited” is that any of the colour bars can be dragged vertically, so one can move around the components to accentuate different elements or paint a different story. This relatively simple interactivity is really quite powerful. In addition, I was able to understand what is actually a quite complicated piece of information very quickly. If you tried to write this out I would take pages to explain or, would be numbers in a spreadsheet I would never really wrap my head around. This form is so intuitive to understand it really is fantastic. And of course, the fact that you can move it around means you can interact with it, play with it, and so engage it and try to understand it more readily than something that is static. These flows are visualized in terms of petajoules, but it would be interesting to see if graphed in terms of value (dollars) as well, as I suspect, that the “pipes” would be very different in size. Really awesome work by Glen here. This entry was posted in cool links and tagged visualization on October 26, 2012 by David Eaves. 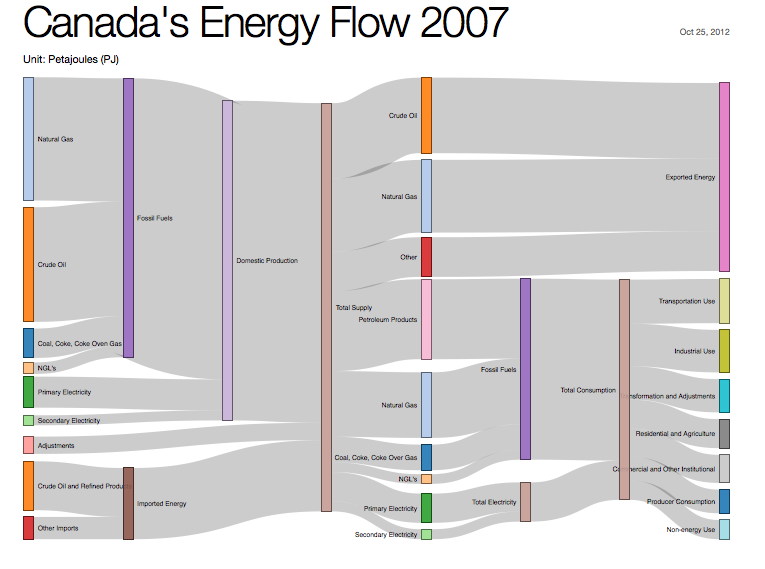 According to this chart, Canada exports zero electricity, which I know can’t be true. Or maybe exported electricity is covered by “Other”? I wonder how this petajoule energy input would align with CO2 output (your basic chemical engineering material/energy balance)? Coal and electricity seem quite small on this chart, yet CO2 generation by coal-fired electricity plants is a large percentage of total CO2 emissions? A mash-up of this data with CO2 emissions might be interesting.